Thanks for all the kind words about the last post–they rocked my socks! <3 2011 is going to be a rockin’ year–I can just feel it! Out here we’re hoping & hoping that it won’t snow tonight, but it looks like an inch or two is inevitable. An inch or two I can handle. Anything more and I’m a bit grumpy (I got my fill last year, thank you). It’s been fun to see the pictures and updates from my friends back in Atlanta, though. Seems like the snowpocalypse is in full swing in the dirty dirty. Granted, while we’re snow free (um, well, it *did* snow on Saturday, how could I forget?) up here in Virginia, it’s still mighty cold, and nothing else beats the winter blues than a pot of soup. Chowder, cauliflower chowder to be exact. 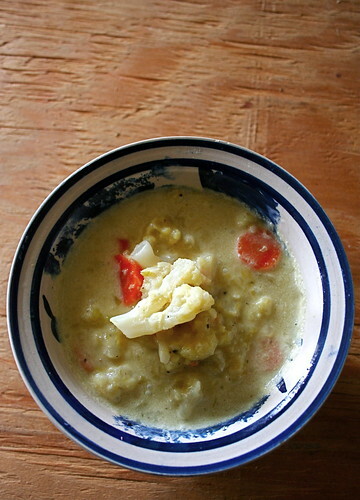 I dreamed up some vague idea of a Thai-influenced cauliflower chowder, but when I finally made it to the store last night to get produce, I flaked out and decided to go with something simple, but something simply good. Using the coconut milk I already had on hand, I paired it with cauliflower, leeks, and carrots for a one pot wonder. Crusty baguette & some Bota Box Shiraz, and I’m one happy woman. Now, let it not snow, please? In a large pot, melt the coconut oil over medium heat. Add leeks and carrots and saute until tender. Add the cauliflower pieces and saute for 10-15 minutes until tender (I put the lid on my pot to expedite the process). Once the cauliflower is soft, add the coconut milk, vegetable broth, and salt and pepper to taste. Bring to a boil, then reduce to a simmer, simmer 15 minutes, then serve. Looks perfect for a snowy (or not!) evening! I love chowders and this one sounds warming and delicious. I *do* hope you’ll enter it in the SOS Challenge this month–ingredient is coconut oil! (Oh, and how I wish I could sip on some Shiraz. . . . yum). This looks so good and comforting. I love cauliflower, but have never tried it with coconut milk. Yes, please! You evil coconut tease! White coconut milk and white cauliflower, it’s like an ode to snow! Thanks for the heads up about matcha, Jes! I’m on a mission to try every single tea and fauxfee out there! Luckily I haven’t had any withdrawal headaches, but I run out of energy at around 7 pm every day. That’s way to early for bedtime! I love the combination of the cauliflower and coconut, Jes. This looks delicious. And I am glad you are feeling back on track for the new year! I write this as I wait for upwards of 20 inches of snow to hit the Hudson Valley – again! It seems the new year is bringing some wild weather as well as changes. All the best to you! Sounds delicious! I’ve never played with coconut oil. Something to try…. Oh, this sounds slightly exotic, but still familiar and comforting- Nice an simple. Perfect balance! That looks so good. I have been suddenly in to cauliflower, I never liked it before but I guess 2011 is the year of cauliflower for me, I am going to add this to my try list! Wow- I’m so happy I stopped by here- this looks INCREDIBLE! I can’t wait to browse through your site more and get some good ideas! Yum! I can’t wait to try this. I’m also using coconut milk as a suttibsute for heavy cream in our pumpkin pie this year. Hopefully it will turn out well. Happy Thanksgiving, my dear.